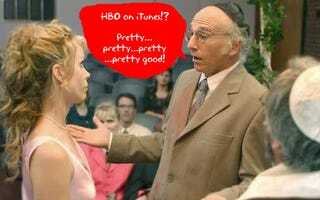 HBO Bringing Shows to iTunes!? According to Portfolio, Apple and HBO will team up to offer HBO original programming on iTunes in the next couple of weeks, and HBO may receive variable pricing and/or a higher profit percentage for its shows than other content providers. This is huge, not only because it marks HBO's first big move into the online media market, but also because they've managed to strong-arm a notoriously stingy Apple into their own financial terms. What's impressive is how HBO got Apple to negotiate beyond its usual terms. If you remember, the fixed $1.99 episode price and profit splitting are what led to the Apple/NBC divorce in the fall. Now, Apple has backed down from its stance and appears to be into the flexible pricing scheme. Portfolio believes Apple wants this partnership to drive Apple TV sales. I also wonder if NBC on the Zune Marketplace shook 'em up a little. And if HBO does come to iTunes, it will be their first mainstream venture into the online media market. They've been hesitant up until now, presumably because it might cannibalize subscription revenue. While they are testing an online on-demand system with a planned national rollout, it's currently only available in Wisconsin, and requires a subscription to HBO through cable providers.